I've made some progress on the orange sweater, I am proud to report. I have a little more than half a sleeve done. I am bummed big time, but maybe the knitting gods are telling me to finish Eris before it gets here. Looks really great and will be very useful, just keep on knitting - or else! Your sweater is so gorgeous! I can see how her shawl pics are tempting you, but you could finish that sleeve really quickly. You're SOOO close to finishing. Finish the sleeve and I will finish some UFOs and then we can Both start Peacock Feathers! I didn't realize I was blogging back and forth with a real live celeb!! I saw the shout out about your shawl pins in Knitters. That's fantastic! I hope you get a ton of new orders! My gosh, this sweater is truly awesome! Seriously, this is one of the most beautiful ones that I've seen for a long time! I certainly do understand how tempting the shawl is to you, but I'd say go on and finish the sleeve, it'll be done in an instant and then you'll be able to enjoy the scarf much more! You're sooo close indeed! 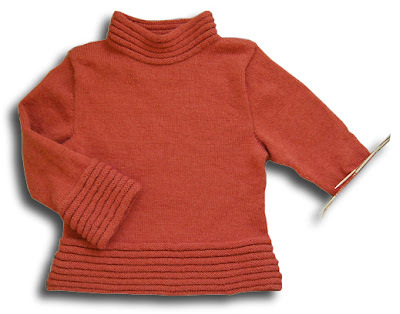 OK, it's not lace, but I bet this will be the perfect orange sweater to lift your mood on a cold, foggy winter morning. Stylish! The orange sweater is gorgeous. When I took a quick first glance, I thought it was a picture from the pattern, then I noticed the needles. Good job! !